American novelist Barbara Bickmore was born in Freeport, New York, on 10 June 1927 and died in Anacortes, Washington, on 23 February 2015 at the age of 87. She lived and wrote in Ajijic from 1990 to 1997 and often described these seven years in later interviews as the happiest years of her life. Bickmore grew up in a middle class family in the New York City suburb of Freeport on Long Island. She wrote her first short story at seven and saw her first Broadway theater play a few years later, beginning a life-long love affair with both literature and theater. At thirteen years of age, while attending Freeport High School, she won second place for oratory for her presentation of “Selections from President Roosevelt’s Inaugural Address”. She completed an undergraduate degree in drama and then married a fellow teacher, Frank Clapp. Her husband taught in Morris, the town where they lived, in upstate New York and Barbara began to teach English and French at the high school in the nearby town of Laurens. Five years later, in about 1955, Barbara gave up this job in order to stay home and start a family. Three children – Debra, Lisa and Mark – arrived in quick succession. By then the family was living in Irondequoit, a suburb of Rochester, on the edge of Lake Ontario in upstate New York. 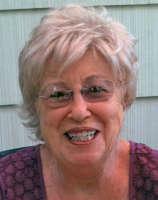 Barbara returned to teaching in about 1961, gaining a position teaching American literature and creative writing at Webster High School, a position she held for twelve years. During that time she also directed a musical “even though I have no musical ability whatsoever and can’t even carry a tune”. After 16 years of marriage, Barbara and Frank Clapp divorced. Not long afterwards, in 1968, Barbara, who continued to live in Rochester, took a sabbatical from Thomas High School in Webster to do her masters degree at the State University of New York at Brockport. She turned down an offer to teach at that university because it paid less than her high school position. Three years later, forced to give up the farm, Bickmore opened a shop for knitting and crochet supplies. The family scraped by for several years but that venture also ended badly, mired in the economic downturn and banking crisis that led to many downtown stores in Eugene being boarded up. Making things even more difficult for the family, Bickmore’s short-term teaching job at the University of Oregon was not renewed because she lacked a doctorate degree. Back in Eugene, she completed her first novel and submitted it to an agent recommended by one of her former creative writing teachers. 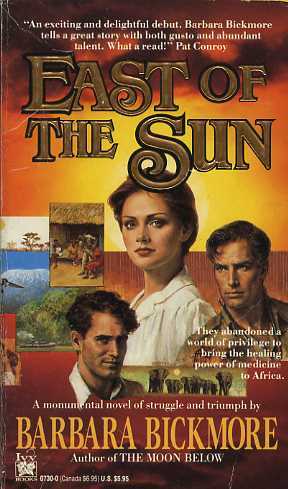 The agent was successful; the novel – East of the Sun – was published in 1988, and Bickmore never looked back. Within a few years, her financial future was secure and royalty payments were sufficient to allow her to live the rest of her life however and wherever she chose. Shortly after the publication of her second novel – The Moon Below (1990), set partly in Australia – Bickmore visited Ajijic where she planned to stay for a couple of months to start writing her third novel: Distant Star (1993), set in China. She liked the village so much she moved there in September 1990 and it became her home for the next seven years. These seven years were easily the most productive period of Bickmore’s writing career. During her time in Ajijijc, she completed Distant Star and four additional books: The Back of Beyond (1994), set in Australia; Homecoming (1995), set in Houston, Texas, and reissued in 2012 as Oberon; Deep in the Heart (1996); and Beyond the Promise (1997), set in Oregon. 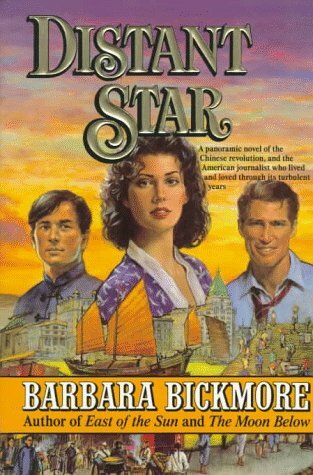 Despite writing so many books while living in Ajijic, Bickmore never set any of her books in Mexico.Bickmore also wrote a sequel to East of the Sun, entitled West of the Moon (2003) and a book set in the U.K.: Stairway to the Stars (2007). Interestingly, Bickmore found far more success with European publishers than with U.S. publishers. Her nine novels were translated into 16 languages and sold in 23 countries. Note that the titles used for translations often differed significantly from the original English language titles. Bickmore lamented the fact that U.S. publishers claimed many of her books were too long and lacked sufficient violence and action. Even so, at least two of her books made the New York Times bestseller lists. In her later years events conspired to prevent Bickmore from completing her tenth novel. She lost her only son in a traffic accident in 2006, when a truck driver ran a red light, and, later that same year, was sidelined for months after breaking her arm. Bickmore’s novels are light reading, aimed at a predominantly female audience. Their main characters are invariably women whose socially unconventional behavior enables them to overcome challenging situations while proving their humanity. After she had become a successful novelist, Bickmore liked to tell interviewers that they were not interviewing her but Cinderella because from the time she had started to write she had lived a fairy tale existence. Ajijic’s very own Cinderella! Barbara Bickmore. 1992. “They Changed My Life”. Ojo del Lago (Chapala), July 1992. Eugene Register-Guard. 2015. Barbara Bickmore Obituary. Eugene Register-Guard, 28 February 2015.